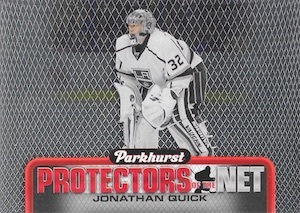 A brand with both a modern and vintage reputation, 2016-17 Upper Deck Parkhurst Hockey sees the return of the storied line in a retail format. Offering a 400-card base set, the challenging build includes 330 current players, 66 top rookies and four checklist cards. Red Border (1:3 blaster/gravity; 4 per fat pack) and Black Border (1:12 blaster/gravity; 1 per fat pack) parallels tweak the main design. 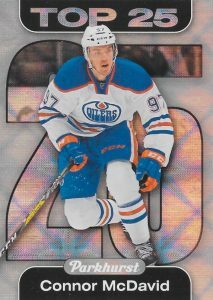 Of particular note to collectors, the set features the first cards for players on new teams like Shea Webber (Canadiens) and P.K. Subban (Predators). Forming the bulk of the other cardboard choices in 2016-17 Upper Deck Parkhurst Hockey, chase inserts are plentiful. Averaging one per Blaster/Gravity pack, and five per Fat Pack, this includes All-Star Favorites, Letter on the Sweater, NHL Centennial Salute and Protectors of the Net. 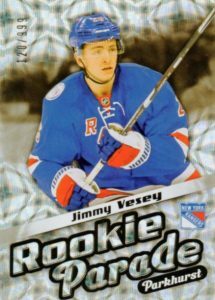 2016-17 Upper Deck Parkhurst Hockey also promises select cards only found in specific formats. 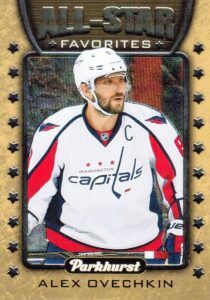 Exclusive to Fat Packs, the Top 25 inserts highlight the best of the NHL at a rate of one per pack. Red (#/100) and Blue (#/25) parallels bring more limited choices. Found in both Gravity Feed and Blaster boxes, Rookie Parade (#/999) honors the most notable prospects and draftees with a Rainbow Foil insert. In addition to Red (Gravity only - #/199) and Gold (Blaster only - #/99) base versions, Blue Autograph (1:216 gravity / 1:240 blaster) parallels opt for a signed element. 2016-17 Upper Deck Parkhurst Hockey also comes in factory team packs. It is important to note that 2016-17 Upper Deck Series 1 features a ten-card Parkhurst Rookie Previews insert that has a similar look. 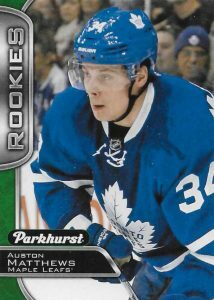 UPDATE: While solicited as being exclusive to Canada, 2016-17 Upper Deck Parkhurst Hockey has also been found in various Walmart locations in the United States. Odds Key: B=Blaster, G=Gravity, F=Fat Pack. PARALLEL CARDS: Red Border (1:3 B/G, 4:1 F); Black Border (1:12 B, 1:10 G, 1:1 F). 33 cards. Blaster/Gravity only. Serial numbered #/999. PARALLEL CARDS: Red #/199 (Gravity), Gold #/99 (Blaster), Proof. 29 cards. 1:240 Blaster, 1:216 Gravity. 10 cards. 1:10 Blaster/Gravity, 1:5 Fat. 8 cards. 1:12.5 Blaster/Gravity, 1:6.25 Fat. 24 cards. 1:4 Blaster/Gravity, 1:2 Fat. Unannounced insert. Work in progress. 25 cards. 1 per Fat pack. PARALLEL CARDS: Red #/100, Blue #/25. When will the checklist be available? Still nothing yet in Wal-Marts here in Quebec… Do you know if the release date changed? Eric, I have not seen them in montreal but the product is on the walmart website. i saw it on the Walmart web site too but it can’t be ordered online and it says out of stock at your favorite location…. Hopefully it comes out soon. There has been a problem with the order. Walmart doesn’t buy it directly from UD, but from a provider situated in Ontario. The delay is caused by an internal misunderstanding. It seems no Walmart in Canada has it up to this day. Seeing cards on eBay so they must be available in some locations. I saw them on ebay too, they will have it eventually.A youtuber also opened a fat pack of it. It’s simple, but I love the Top 25 inserts. The use of a reflective element gives it lots of life. It’s my favorite of all the sets. Haven’t been able to hold one, but they look great on eBay. The distributor is destroying the hobby. They keep on raising the price. It then raises the hobby price. Maybe they are messing with Walmart. Paid 20.00 for blasters here–what I thought it would be. Someone mentioned finding these the US. I noticed a couple resellers on eBay were also from the US. Weird considering it’s supposed to be a Canadian exclusive. Unbelievable. So not only they screwed up the release in Canada and people all over the country wait for a product that was supposed to be released a week ago, but you can find the same product, which is Walmart Canada exclusive, in the USA!!! This is not only greed anymore, but UD becomes more and more incompetent. I love the insert cards. The price is great for the fat packs and regular packs at my local Walmart. 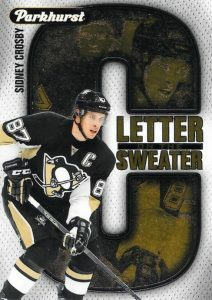 I like the NHL Centennial Salute and Letter on the Sweater inserts. My best card so far is /25 Blue Top 25 Stamkos. Base cards are the usual green colour. Great price for kids to collect if you can find them. What province are your from Mark or are you from the USA? I’m just curious if you found these in Canada or in the USA. From Ontario, Canada. The great city of Ottawa. I have not seen boxes yet. Bought the packs individually. Saw blasters of this at Walmart here in Durham, NC today. Yes it is available as factory team sets, but those team sets have 10 cards per set, but the full parkhurst set has 11 per team plus any rookies they may have. So can you call that a true team set????????????? @TreyTreutelI don’t see the odds for it but on ebay i’ve seen rookie parade proof cards. Guess Exclusive to Walmart Canada is incorrect per comment of Gabe of Durham, NC. No boxes yet in Montreal as of today, bummer…. I am in Lakeland, Florida. USA. I bought 6 blasters today from my local Walmart. So much for Canadian Exclusive. Got some decent inserts and a Matthews Rookie Parade. Out of six blasters, which is 720 cards, still couldn’t complete the 400 card base set. Great Upper Deck collating again. Pretty sad. I think they have fat packs in sallaberry as seen on ebay. I found some fat packs a few days ago at a Toys R Us in Michigan. Got Marner, Werenski and Vesey rookies. I really like the set, hope I’m able find more. You guys need to be specific on “blasters.” Here, in North Dakota (USA), these preview cards are only the “mega” or “black friday” boxes (as WalMart calls them). They are the same odds as a tin (3 YG’s/box) + the 3 card Parkhurst pack. Minnesota has the same exact thing, along with the Jumbo Young Gun in the blaster ONLY at Walmarts. 3 stars not enough bang for the buck. Autos are to hard to get have only pulled one in a lot of boxes. 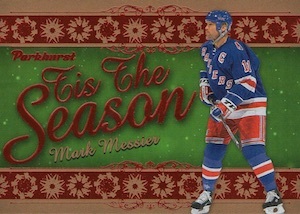 The tis the season cards are few and far between as well i have found two Patrick Roy and Wayne Gretzky. I pulled in 5 boxes. Finally Upper Deck considered the everyday collector. Not only is the price right but the cards are nice with a thicker card stock and glossy finish. 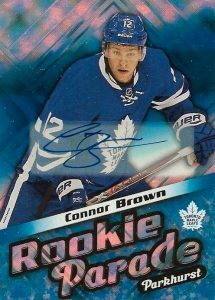 Its about time Upper Deck released a low end product that doesn’t require redemption cards for the top rookies like its OPC and MVP products. Not everyone wants to shell out hundreds of dollars for high end product or limited redemption cards. Mike Z, this is a set of Parkhurst on it’s own. Nothing to do with the 3 card bonus packs you get in the Parkhurst Series 1 boxes from Walmart. On the subject of Walmart; I built my 15/16 S1 from the PH boxes from Walmart all purchased within days of being put on the shelves for the black friday price. Pulled 3 McDavids YG, red, blue and many greens, no problems, didn’t feel like a was getting ripped off, just the opposite. But I have always wondered about product on their shelves as sometimes I feel like the ‘Matthews YG’ isn’t there. I finally ran in to the person stocking the shelves from a separate company in Canada. I watched them open and do it. Person opened a sealed box from the company that stocks the shelves, in that box was 2 cases of tins, both were open. The UD tape was cut, both cases had 12 tins. I asked why they would be open and was told maybe they wanted to make sure they were all there, really? I also asked if every in had to go on the shelf and the answer was yes and they did. Makes me wonder why they were open. Am I dealing with the same thing at Walmarts that I have to deal with at some hobby shops? Is someone pulling the Matthews tins from the cases? Maybe it’s nothing or maybe it’s something. I wish UD could do something like they did with the bogus inflated prices by distributor and hobby shops in Canada. I feel and have felt for a long time that the only way to buy product is by the factory sealed case. That’s a lot of money. 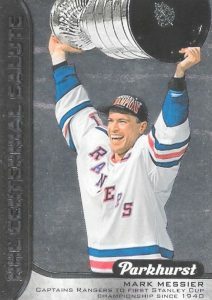 I found nothing on either Cardboard Connection or Beckett about the Rookie Parade “PROOF”s….????? They are an unannounced, limited parallel and are listed under the parallels for the Rookie Parade inserts. Great product, good price point. I was leery at first, thought it was “too cheap”, but not anymore. Very good quality cards. Easy to build a base set, the Rookies aren’t SP like other sets, there’s only a few insert sets, and not a ton of parallels. Glad there’s no jersey cards (too many out there), the autos are a nice chase element. I will say, as someone that is getting back into collecting, my only place where I can buy cards is from a store similar to Walmart, and the only selections they have are 16/17 UD S.1 and these 16/17 Parkhurst packs, so my selection is way more limited than most if I want to buy retail, but I will say this much – although I enjoy the “Young Guns” from Upper Deck, I really think the Parkhurst are much nicer cards and offer more parallels….. I think I’m breaking even as far as what I pay, generally – I just like the Parkhurst more. Pretty good product. I got a bunch of parkhurst rookies. I also got an auston matthews rookie parade proof card. Wondering how many of these cards are out there. I have only seen one on ebay but the guy was selling it for 500 dollars. Anyone else got the matthews proof card? HH-I am talking about the Parkhurst set of its own. The 10-card set. Then in the series 2 “Mega Boxes” (no clue why some are calling them blasters-they’re twice the size and value sans the Walmart ones with oversized YG’s. See what my (just a) BGS 9 of Austin Mathews’ Jumbo YG sold for a few days ago?? I have another Auston 9.5 BGS, McDavid 9.5 Jumbo & Red Parkhurst from the Megas here in the Canadian Province of North Dakota. So, no I got the difference. I can surely say I dont think I have ever opened up a pack of Parkhurst in my life. Just the green “preview” or “special” ones inside those UD Megas. You’re right onto something with those opened Tins. I’ve bought a bunch over the past few years from the usual sites and some were too ridiculous to believe: Sealed tins, and every pack inside was super easy to pull open-with the one end’s foil tattooed on the other side before I opened them. As if this isn’t enough work, they try to be funny or want all the cards inside. So they replace every card with 1990 Donruss Baseball one time. So at some point after those tins were purchased from the UD Wholesaler, I’m guessing somebody had a bit of “alone time” with his goodies. Mike Zink, what in the hell are you talking about? You bought sealed tins that were filled with 27 year old baseball cards?